We should always thank God for his goodness and His mercy. And so even today, this is the day that the Lord has made and allowed us to participate in! And because we know His will is good, it is perfect and it is acceptable, we should rejoice in that! So, just like the disciples, we know that there is suffering ahead of us as we strive to live the lifestyle of Jesus and also to complete the godly assignment that has been set before us. 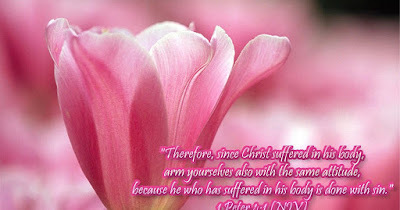 Peter tells us that we are to arm ourselves likewise; that even as Jesus suffered, so shall we. If we are not having any suffering in our life, perhaps we should evaluate our self to see if we are working on our assignment. In today’s society, with a lack of morals and ethics, it is easy to be distracted by the cares of this world; to be caught up in our life situations, our issues or whatever, but as followers of Jesus Christ, we can’t let our cares and concern keep us or hinder us in our race. The last thing we should want is to run this race in vain. Hopefully, like me, you’re looking for your crown; your reward that Apostle Paul speaks of after having run this race as a good soldier. In order to receive that reward, we must continue, or in some cases start, pressing toward the goal unto the prize of the high calling of God in Christ Jesus. In Romans, Apostle Paul lets us know that all things work together for the good of them that love the Lord and are called according to His purpose. Note that all things work together for THE good; not our good but for the good thing that God has purposed in our life according to HIS will. This lets me know that sometimes God will allow things in our life that will bring us to the purpose that He has designed for our life. So it may not always feel good, it may not always look good, it may be painful and you may think you will never see the light again, but what we don't see while we are going through difficult times is God working behind the scene orchestrating people and situations on our behalf. That is powerful because God gave Isaiah a glimpse of who He is and how powerful He is! Dear Lord, we thank You for this day thus far. We thank You for the life you've given us, for our health and for our strength. We thank You Lord for being in our right mind; not only mentally, but most of all, having a mind to serve you. We come to You heavenly father with thanksgiving in our hearts knowing that You and only you are able to supply our every need; to equip us to run this race, to defeat everything that comes up against us, everything that is not like You and in so doing, we obtain the prize in Christ Jesus; the reward that only You can give. Help us dear Lord to strive for mastery in this race; for endurance to remain to the end for we not only want to hear You say “Well done, my good and faithful servant” we want to hear You say “enter in”. Help us Lord to bring our mind and our bodies under subjection of Your will; help us to change our mindset to have Your mind; knowing that Your will is good, it is perfect, and it is acceptable; that You are the final authority in our lives. Lord You said in your word that You know the plans that you have for us; plans of good and not of evil. Help us Lord to see what You have for us and to walk in that direction. We thank You heavenly father because there is a secret place in You where we abide, where You hide us from our enemies; where we can be refreshed in You. We thank You God for Jesus who You sent here to save us and wash our sins away. Thru His blood, is the power to endure every bad and evil thing that comes against us. It is thru Jesus that we have the power to run this race. We thank You Lord because we have someone in You to call on, when we’re in need, You’re the first one we’re to call on and You come down and see about us. Increase our faith dear God to realize that it is You and only You that make us victorious; all for Your glory and so we want to be glory carriers, we want our lives to shine; we want to be that beacon on a hill that others see so that they find their way to You. We know Lord that we are not saved to sit but that we have a mighty work thru You to do. If ever we needed You, it is now Lord - as we wait on and receive instruction from You. Open our heart and ears to hear and receive Your word. Oh, Lord, we love You because You first loved us and purchased our pardon way back on Calvary; even then knowing that You had a work for us to do. You are our precious redeemer, and we pray that You bind us closer Lord to You. Every hour of every day, we pray that You send Your power, because we can’t make it without You. Lord, help us to be strong and of good courage knowing that You will never leave us nor forsake us. You’ll be with us, You will lead us and guide us in the direction that we’re to take. Lord we acknowledge that we just can’t do without You, we can’t win without You, we need Your power and Your strength. We realize that it is no goodness of our own but You Lord, in Your sovereignty, that keeps us and allows us to accomplish Your will in our lives. We can’t help our self, we can’t do it on our own. We need You, Lord, we cling desperately to You; knowing that you are the director of our path. Help us Oh Lord to stay on the path that You have set before us; not veering to the left or to the right. Help us Lord to meditate on You and Your word day and night. Help us Lord even as we meditate on You, to hide Your word in our hearts so that we may not sin against You. Help us to keep our focus on You; You said Lord in all of our ways to acknowledge You and You will direct our path. Lead us and guide us in the way that You would have us to go. So be encouraged to run this race all the way to the finish! In Jesus name, we can do it.